Reminding language is a powerful tool that is really easy to forget about--at least it is for me! I always need to make a conscious effort to use it, but I am always glad that I do. When I'm having difficulty in my classroom, 90% of the time it can be solved my tweaking my language. Especially during transitions! You don't need to list the same directions over and over again if your students truly know the routines and you've done your job with interactive modeling. Try saying something like, "Everyone stop! Remind me what you should be doing right now," or, "Remember our rule about classroom materials." If you know your kids are antsy prior to transitioning, you might even quickly ask beforehand, "What were the directions?" In my classroom, this is especially helpful when kids come up to hug me. This year I have a VERY huggy class (which is likely exacerbated by the fact that I'm a huge, warm fuzzy too!). While I love getting hugs from my students, it's not appropriate when it's learning time. If a student comes to hug me during a transition time or when I've given a direction, I always ask, "What should you be doing right now?" or "Show me your job." I used to feel bad about this, but I've come to realize that it's necessary for my sanity and for my students' ability to be productive. It stops you from talking too much. "What are our routines for unpacking?" It works for academic situations too--and brilliantly, I might add! Instead of going on and on about independent clauses and dependent clauses and how they need to be joined with a semi-colon or a comma and conjunction, say, "What punctuation mark needs to be in your sentence?" It places ownership on the students. When you are the teacher, your job is to TEACH--not to spoon feed. It's really hard not to do the work for students, but it's not serving them. It sure isn't serving you either! If a student needs to be doing something, why should they do it if they know they can depend on you to keep them on task and following directions? Why should they think for themselves? They are going to learn not to be independent if you reinforce fixing everything for them. 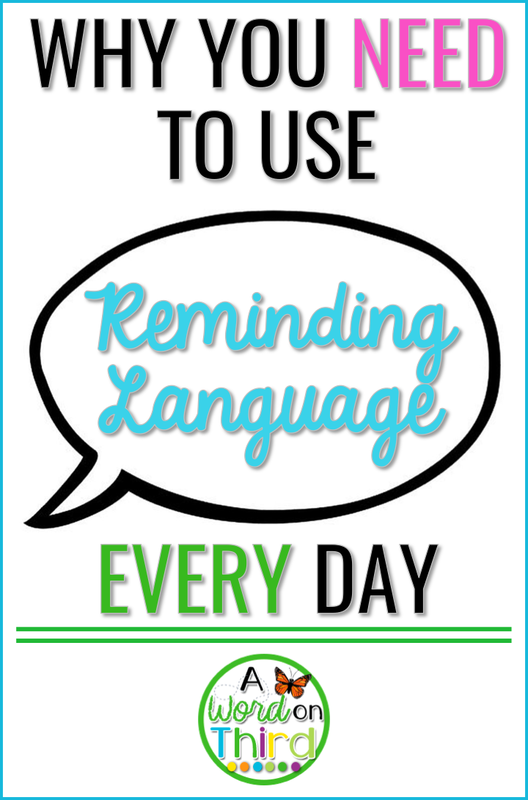 Instead of fixing the problem you hear about when you pick your kids up from recess, try some reminding language! "What did we learn about conflict resolution?" "How might you use an I-message?" "What problem solving skill might you choose?" HAPPY REMINDING, EVERYONE! I promise you will feel more patient and sane when you do this every day! I love your Responsive Classroom refreshers! I'm trying this tomorrow. p.s. I have two overly huggy girls this year, too!